Back in October whilst reading Jim Hindle’s excellent book Nine Miles I was saddened to learn of the passing of legendary theoretical architect Lebbeus Woods. Woods’ musings questioned the dull status quo of much commercial construction. His dystopian explorations examined challenging liminal spaces and imagined a kind of futuristic and mysterious crystalline barrio-vernacular. He sketched vibrant autonomous communities within war shattered cities and envisaged science fiction landscapes comprised of luminous splintered geometries fluttering at the very edge of physics which endeavoured to offer up a direct political dialogue with the inhabitants. Architect Stephen Holl wrote on his passing ‘the freedom of spirit in architecture that Lebbeus Woods embodied carried a rare idealism. 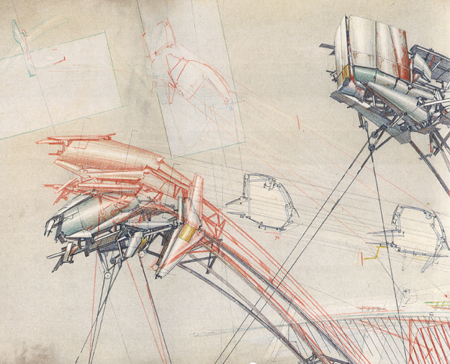 Lebbeus had very passionate beliefs and a deep philosophical commitment to architecture. His designs were politically charged fields of reality that he created’. What does this have to do with Nine Miles? Well, Jim Hindle’s frank autobiography documents two winters of road protests at Newbury and beyond. It is one illuminating story amongst many in a decade of heroic activism that witnessed many people from all walks of life uproot themselves and deliberately live in the margins of society in order to challenge the crushing machinations of state sponsored landscape destruction. It is within the temporary autonomous zones of the various road protest movements that the spirit of Woods’ spidery sketches coincidentally lived free as a tangled architecture of anarchistic tree houses, rope bridges, damp tunnels, patchwork squats and skeletal road block tripods (witness superb photographs from these times from the likes of Andrew Testa and Adrian Arbib). These structures heralded a late 20th century alternative vernacular of sorts as environmental activists shared various DIY construction techniques and resources to defend numerous sites. I was reminded of Calvino’s Invisible City of wires Octavia whilst reading about the perilous tree houses at the Newbury Bypass camps. Calvino penned ‘This is the foundation of the city: a net which serves as passage and as support. All the rest, instead of rising up, is hung below: rope ladders, hammocks, houses made like sacks, clothes hangers, terraces like gondolas, skins of water, gas jets, spits, baskets on strings, dumb-waiters, showers, trapezes and rings for children’s games, cable cars, chandeliers, pots with trailing plants. Suspended over the abyss, the life of Octavia’s inhabitants is less uncertain than in other cities. They know the net will only last so long’. The camps were equally fragile and in constant flux. Hindle described his first night up a tree as having ‘the distinct feeling of being on a boat’, kept safe by ‘the umbilical cow’s tail of my climbing harness winding out and securing me to a separate loop of rope tied to a branch’. The various locations at Snelsmore Common, Castle Wood and the Kennet amongst others comprised of a huge variety of both tree-borne structures to stop the ancient boughs being felled as well as communal ‘benders’ and other bridging systems. Sadly they were ultimately a futile attempt to prevent the wider landscape being gouged out, cutting through Sites of Special Scientific Interest, a prehistoric settlement, an Area of Outstanding Natural Beauty, civil war battlefields and the micro habitat of a rare snail in order to satisfy rampant car drivers. The wider anti road protest movements of the ’90s embraced groups such as Critical Mass, Reclaim the Streets and Earth First who attracted all manner of diverse people seeking to rebalance our urban spaces. Many reference Marshall Berman’s All That is Solid Melts Into Air as an influence, ‘at the ragged edge of Baudelaire’s imagination we glimpsed another potential modernism: revolutionary protest that transforms a multitude of urban solitudes into a people, and reclaims the city streets for human life’. These new fabrications subverted the banality of contemporary space in order to engender entirely new methods of living, a spirit which encouraged many to reassess their relationship with the green land. Nature writer Roger Deakin observed of one such back-to-nature community Tinker’s Bubble (a collective woodland hamlet in Somerset) that it is a ‘demonstration that there is another way to live, on terms of greater intimacy with the woods and land – slower more deliberate and benign: a quiet assertion of greenwood values’. The disparate encampments which faced off against the yellow jacketed private armies of the construction companies with their thunderous JCBs and snarling chainsaws sought to directly reaffirm this intimate greenwood value. The squat, the tent and the traveller’s van are habitats of the ephemeral, touching lightly upon the ground and living frugally, a lifestyle which has partly lead to a burgeoning micro-house movement which underpins a backlash against the carbon hungry monster house sprawl of western suburbia. These are minimalist vessels for living in what George Monbiot describes as ‘an age of entropy’, a battle to resist the Stockholm Syndrome seduction that big oil has over all of us. Lebbeus Woods in an interview with Geoff Manaugh reacted to the tricky issue of questioning how we live in this age of entropy and said ‘As I wrote some years back, architecture is a political act, by nature. It has to do with the relationships between people and how they decide to change their conditions of living. And architecture is a prime instrument of making that change – because it has to do with building the environment they live in, and the relationships that exist in that environment.’ For Woods the fabrication of these experimental spaces was a critical aspect for fashioning new architectural ideas. 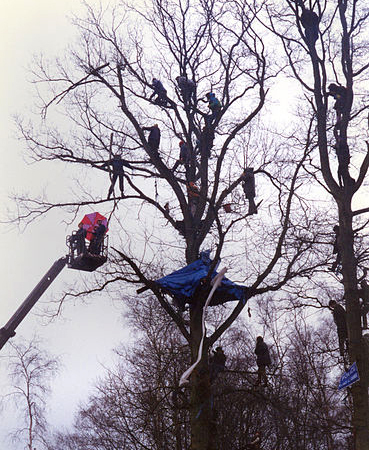 The dense foliage of the protest camps provided the activists with a potent environment in which to play, echoing Gaston Bachelard’s quote regarding Menard ‘in the woods In the forest, I am my entire self. Everything is possible in my heart just as it is in the hiding places in ravines. Thickly wooded distance separates me from moral codes and cities’. The protest vernacular, an architecture of anarchy or (an)architecture, as a result of human turbulence, becomes like a living thing in itself. Roger Deakin again, ‘the house represents what we ourselves would like to be on earth: permanent, rooted, here for eternity. 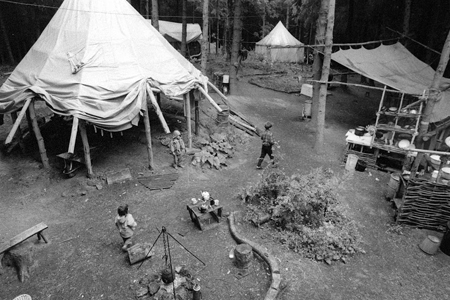 But a camp represents the true reality of things : we are just passing through’, so as the diggers rolled on and the woods were torn down the people pass on through leaving only ghostly memories of proud oak and gnarled root. 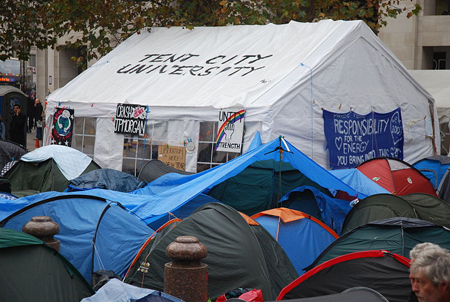 I’m reminded too of Brian Haw’s brave anti-war protest tent in Parliament Square and of the Occupy movement’s tent universities in a number of cities. Indie film maker Dreamtime Films has two incredibly moving and beautiful short films which capture this vibrant sense of environmental liberation, protest and of touching the ground lightly. I Am Alive is a powerful love poem to the DIY road protest culture of the ’90s and Live Before You Die follows a band of Travellers with handcarts, goats, donkeys and ponies along green lanes to the fairs and festivals of England in ’95. Gill Barron narrates both and says ‘the land was here before us and the land remains’ and observes they were ‘travelling light, just passing through’. Both suggest a sense of gossamer impermanence and fleeting life. One can easily imagine Lebbeus Wood’s vast inky scrawls attempting to provide a stage set to these epic challenges, a free-space framing man’s conflicts with each other and the landscape. Geoff Manaugh wrote of his passing ‘Architecture is about the lack of stability and how to address it. Architecture is about the void and how to cross it. Architecture is about inhospitability and how to live within it. Lebbeus Woods would have had it no other way, and – as students, writers, poets, novelists, film makers, or mere thinkers – neither should we’. Nine Miles is a powerful record of living in Woods’ unstable and inhospitable times, and building optimistic bridges to cross that perilous void. We watched closely from the sidelines the Runway 2 protest at Manxhwester airport: 1995/6. We still have film footage that ‘s never been used – somewhere, in storage in London I think. It was an eye-opener in many ways – how the protest cann be overrun by for want of a better term ‘career- protesters’: ‘What are you protesting about, Jimmy? ‘, “What have you got?’ And how the protesters of the specific presumed a moral edge over the professional protester. Very good write-up once again. Very thought- provoking. Good stuff! Particularly liked the Calvino connection!! As always you are too kind! How interesting regarding the airport, let me know if you ever manage to digitise any of it! The Nine Miles book is a great insight into the often conflicting world of protesting, as each location attracted all manner of waifs, strays and hardened activists. The airport involvement was a part radio thing – my wife writes for the radio. She got a R4 commission for a play on the subject from it. A lot of it gave her the horrors – don’t hold your breath for digistised excerpts! Great post Matt – lots to think about and a gem of a Calvino quote. Thanks very kind, there’s an Invisible City out there for every situation! Exemplary links on this Matt – love all the interconnections. I was following the last tree protest in Hastings (Combe Haven) at the beginning of the year with sinking heart. 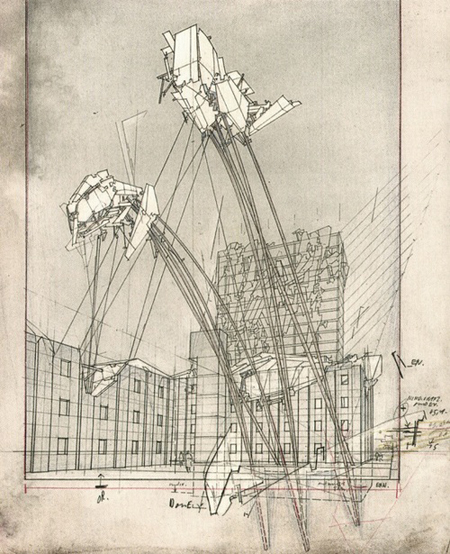 I have heard of Lebbeus Woods (apposite name!) but never known much about him so thanks for this. Thanks very kind, he was a fascinating character, often at odds with the establishment and always provoking debate! Thanks for this illuminating essay – that has exposed me to some amazing people. I was exposed to a little of this – about a million years ago! – when I was in college. Back then I read up on John Turner (Housing by People) and the spontaneous settlements in Peru. Even though I’m mainly a horticulturist I’ve always been interested in cities – and how we can improve them. I think we are at an interesting time in civilization. I believe we have the tools we need to do it right, but I’m not sure we’ll use them. Thank you again! Thanks very kind, I will Google the Peru settlements. You make a good point regarding tools, it’s that opportunity which may well be the brightest in the end.